The roof signs are made out of a UV stable acrylic, giving a high white, high gloss sign. Please choose your typestyles, colours and background colour if required and the position of icon. The magnets are 2 large square "plate" magnets riveted to the base, which in turn is bonded to the top. on your choices of colour and sign type. Please select a font for each line of text in your sign. 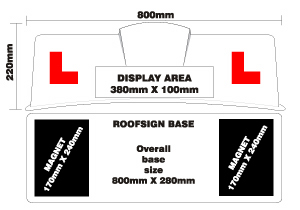 Click the button below to add the Centre Feature Scanasign - ROOFSIGN to your wish list.